Glastonbury Festival is the largest greenfield music and performing arts festival in the world, with around 175,000 attendees. Event LED Signs have supplied signage systems to this iconic event since 2011. 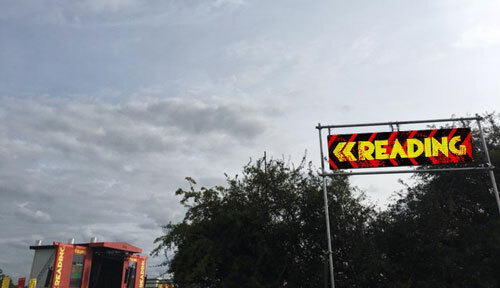 The signs are used primarily to help festival goers to safely reach late night venues in the busy South East corner of this large site after the main stage acts have finished. Under the direction of the Event Control Team, the LED signs are updated in real time to help with the flow of festival goers and reduce excessive build up of crowds. Download is one of the most popular Metal festivals in the UK. Event LED's signs are deployed around the site to relay vital event information to the 80,000 customers that attend. The Festival organisers use the signs in the campsites, arenas and at entrance and exits to communicate with their audience. The information displayed is updated from Event Control and includes general information, safety, missing persons, directions and egress movement at the end of each night. 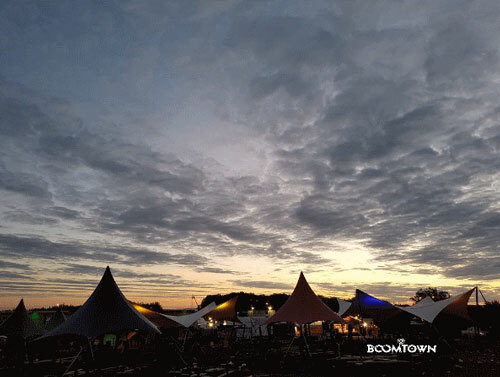 Boomtown Fair is a highly creative Festival that takes place near Winchester. Event LED Signs installed a number of signs throughout the site to give festival goers information and directions. 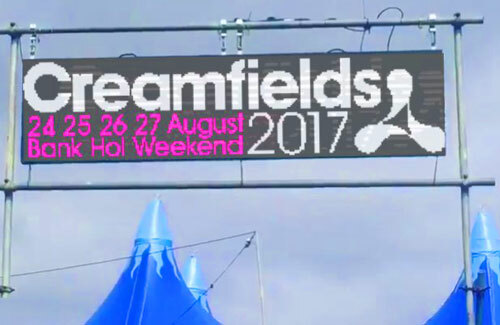 The signs were managed by festival staff who used the software supplied to display messages using text and graphics for maximum effectiveness. Barclaycard presents British Summer Time takes place in Hyde Park, London and is now a firm favourite with urban festival goers. Event LED Signs provided 'Info Totems' once again this year for communication with the large audience. Signs were installed within frameworks attached to scaffolding towers. The towers were wrapped in branded vinyl to create info totems, with the LED screens displaying various messages throughout the site across the crowds. By day the signs showed information regarding essential services plus general information and safety announcements. At night they switched to egress signs to help the crowd safely find their way out of the site. The nature of the signs enables the messages to be varied - as an example the displays could show an EXIT message followed by the nearest Underground station from that exit. Over 400 competitors from 13 nations will took part in the Invictus Games, an international sporting event for wounded, injured and sick Servicemen and women, at the Olympic Park in London 2013. LED signs were used for the closing concert of the event, to direct the audience to facilities during the concert, and best exit and transport routes at the close of show. Event LED Signs are used at Reading Festival in the arenas and as variable EXIT signs on gantries for the crowds at the close of show. Large signs within the arena are used for general information messages and directions. Signs direct the crowd to the most suitable exit for their mode of transport or give colour coded directions to their Campsites. The information is updated by the Event Control Team as required. T in the Park is Scotland's legendary music festival. Event LED Signs have provided signs in a prominent positions for festival goers to see as they enter and leave the arena. The signs are used for general information, health and safety advice and also inform the audience of the amenities and areas around the site. Hyde Park Winter Wonderland is a free to enter event held in Hyde Park for six weeks to include the Christmas period. Visitors are attracted by ice sculptures, the ice rink, Christmas markets, mulled wine and themed rides in what has become a destination event for London. Event LED Signs has provided scrolling LED Signage for the Christmas season at Hyde Park Winter Wonderland since 2012, supplying updatable signs with Christmas themed images to fit in with the festive feeling. The signs show their reliability by being in constant use for eight weeks during all kinds of winter weather. Since 2016 Event LED Signs have provided signage to the iconic RHS Chelsea Flower Show. The signage was used prior to the event to help with Health and Safety for contractors and show gardeners, and then during show days to keep the visitors informed of upcoming activities, safety advice and directional info. The RHS Chelsea Flower Show is the most famous flower show in the world, with around 35,000 people attending each day. Creamfields is a large dance music festival featuring DJs and live acts. A regular winner of the Best Dance Music Festival, the festival is held annually on the August Bank Holiday weekend in Daresbury. Event LED Signs has been working with the Event Control team since 2013 to deliver vital communications to the audience. Multiple units are positioned at the Campsite Hubs to deliver information like show times, campsite details and security updates. The number of units used site wide significantly increased the penetration of the messages displayed. 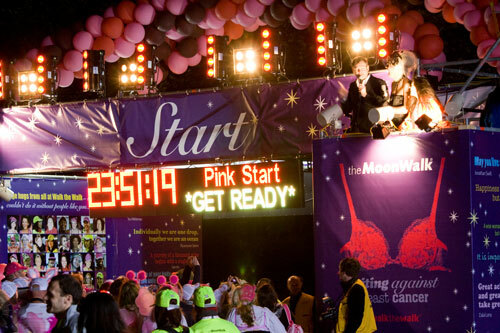 Event LED Signs have provided the start and finish clocks for Moonwalks in London and Scotland - charity events held to raise money and awareness for breast cancer. The LED digital signs provided timing clocks at both the start and finish lines, with a scrolling section to give the walkers instructions on when to start, safety advice and words of encouragement for the big feat ahead! The signs are made from a number of LED panels joined to a size of 3.84m wide, by 64cm high. Bestival is one of the original 'boutique' festivals. To help with audience communication, a number of signs were placed around the site to keep festival goers up to date with timings, information and directions. Event LED Signs have provided signs that fit in with the imagery of the event as well as being a useful way to send important information across the site.